Today many companies are offering products that claim to filter or harmonize EMF energy in the home but few have measurable solutions. 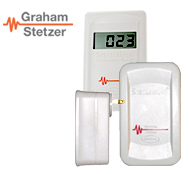 Graham-Stetzer (GS) Filters are the only product that has been scientifically proven to eliminate the most "biologically active" EMF frequencies (4 to 100 kHz) that ride on a building's electrical wiring, therefore reducing a person's exposure to this harmful EMF energy. Learn more about GS Filters, GS Meters, the science behind these GS products, and how to install these products. The effects of electromagnetic pollution on humans are cumulative. Scientific studies show that by equipping a home with GS filters it's possible to alleviate many of the symptoms associated with electrical sensitivities, while at the same time protecting one's health by reducing ongoing exposure to harmful dirty electricity. Health benefits reported by users include better sleep, less stress and anxiety, less joint and muscle pain and a reduction of nervous system symptoms among others. Children with asthma, ADD/ADHD and autism have also benefited greatly when GS filters were installed in their homes and schools.